I've been dreaming about chocolate lately. After gorging an entire bar of Green & Black butterscotch chocolate in one night, I felt decidedly guilty. Well, not guilty enough to stop myself from whipping up a batch of chocolate brownies but a tinge of conscience made me reduce the amount of sugar and eschew the extra milk and white chocolate bits that I'm suppose to toss in. I often find myself tweaking recipes to suit my taste as I can't stand overly sweet dessert. I find that most recipes use far too much sugar which is totally unnecessary unless it's to mask the lack of flavor. 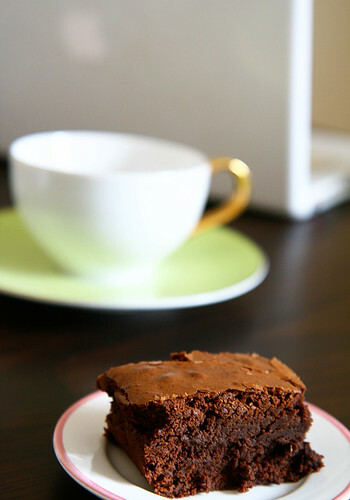 I've posted a recipe for chocolate cranberry brownies previously which has a more fudge like texture. I'm particularly pleased with the batch I made today. It's incredibly simple, straightforward and the result is divine. Just make sure you let the brownies cool down for at least 10-15 minutes after you've taken the tray out of the oven or else it will crumble into smithereens the minute you cut into it. I served this warm to my friends who came over for dinner and it worked a treat. Please excuse the wonky shot of the brownie. By the time I got around to photograph it, there was only a single slice left. Click here to see the recipe. Thanks, Heather. It was a quick impromptu snap before L and I down the entire brownie. I've decided not to bake for a little bit. Just noticed that I've grown another chin! Thanks, Lisa. I might just take you up on your offer.